Clearomizers There are	4 products. Breites Spektrum van Cartomizer - Gewinde 510 (Watte, Keramik und Clearomizers). SMOK Micro TFV8 Baby Beast available in silver color. Eleaf iJust 2 atomizer with huge capacity 5ml. 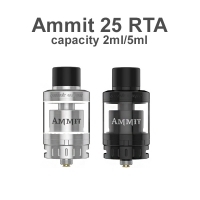 GEEKVAPE Ammit 25 RTA Atomizer available in a few colors.